So, by the end of 2016 everyone is well aware of terms LTE and VoLTE which can be seen mobile devices under 4G spectrum. Basically VoLTE is an update for LTE . Using VoLTE we can make calls over LTE network. 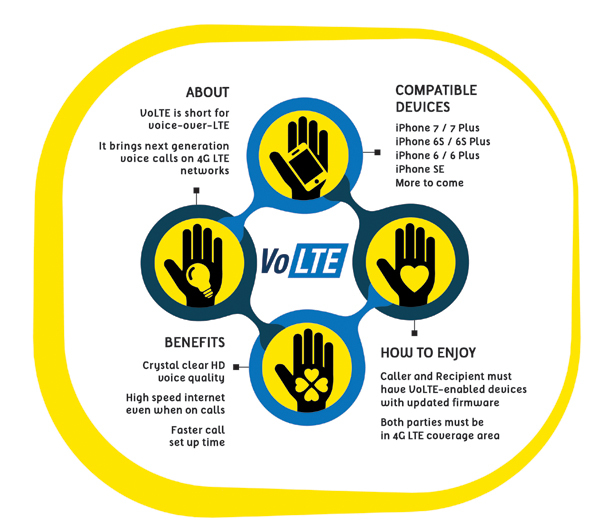 What are the benefits of VoLTE? Superior call quality – The big advantage of VoLTE is that call quality is superior to 3G or 2G connections as far more data can be transferred over 4G than 2G or 3G. Up to three times as much data as 3G and up to six times as much as 2G to be precise, making it easier to make out not only what the person on the other end of the line is saying, but also their tone of voice. Essentially it’s an HD voice call and it’s a much richer experience over all. Improved coverage and connectivity – VoLTE can connect calls up to twice as fast as the current methods and as 2G and 3G connections will still be available when there’s no 4G signal it simply means that there’s greater mobile coverage overall, as currently places with a 4G signal but no 2G or 3G means that one you can’t make or receive calls. You might think that would be a rare occurrence, but some of the frequencies that 4G operates on, such as the 800MHz spectrum, have far greater reach than 2G or 3G spectrum, so you’ll be able to get signal further away from a mast or in buildings which other signals struggle to penetrate. Indeed, Three is fully relying on its 800MHz spectrum for VoLTE calls. However, while 2G and 3G services would likely remain they wouldn’t be as necessary as they are now and much of the spectrum used for 2G in particular could potentially be repurposed to increase capacity on 4G networks. Anyone who currently uses 4G could also find their battery life increased with VoLTE, as right now whenever you make or receive a call your phone has to switch from 4G to 2G or 3G, since 4G calls aren’t supported (other than on Three Super-Voice) and then once the call is finished it switches back again. All that switching, plus the need to search for a different signal each time, can give the battery a significant hit. except you’d just use your mobile number and be able to use the regular dialler and call interface, so you can make and receive video calls from anyone else with VoLTE, rather than relying on separate accounts. In fact you may have noticed that Skype and other existing video calls services often seem to have superior audio quality to voice calls. That’s because like VoLTE they use more data as part of a similarly named VoIP system, so you can expect your voice calls to start sounding more like Skype calls, but they won’t hit your battery life as much as Skype does. Not only could video calls become native to the dialler, but other Rich Communication Services (or RCS’s) could as well, such as file transferring, real time language translation and video voicemail and there may be applications which haven’t even been thought up yet. As VoLTE is tied to data it could also mean that you won’t have to worry about how many minutes you use, as everything will fall under data use. The problem with Voice over LTE is that 4G LTE is a data-only networking technology, so it doesn’t natively support voice calls. While 3G and 2G were primarily designed with voice calls in mind and data was added to them. The data charges are costly and datapack can be completed faster when we are over 4G . You have any doubts regarding anything you did not understand please contact and if you like please do share it. Hope its helpful.